You only need 3 ingredients to create this healthy raspberry frozen yogurt. It’s the perfect summer dessert: refreshing, smooth, creamy, delicious, and bursting with raspberry flavor! 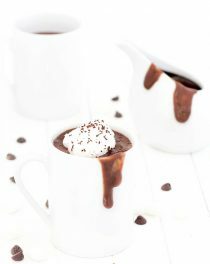 With only 140 calories per serving, you can enjoy this scrumptious frozen treat without having to feel guilty about it. Frozen yogurt is incredibly easy to prepare. 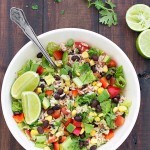 Place all the ingredients into a blender then pulse until well combined. If you prefer it soft serve, eat it right away or, for a firmer texture, freeze it for a couple of hours stirring every 20 minutes. If you don’t stir it regularly, the yogurt around the edge of the container will get too hard. You can even use an ice cream maker to get a creamier frozen yogurt, but it’s not necessary. The sweetness will depend on how tangy your plain yogurt is and on the sweetness of your berries. Adjust the amount of honey to your taste. Use your favorite brand of plain Greek yogurt. It can be full fat or low fat. I used 0% fat but I think that if you use full fat you will get a creamier frozen yogurt. You can also try this recipe with any other fruits or leave the fruit out and add vanilla bean. 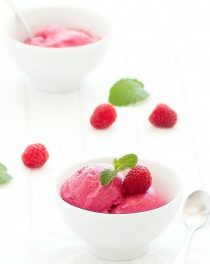 This healthy raspberry frozen yogurt is the perfect dessert for summer, when you want something sweet and fresh! 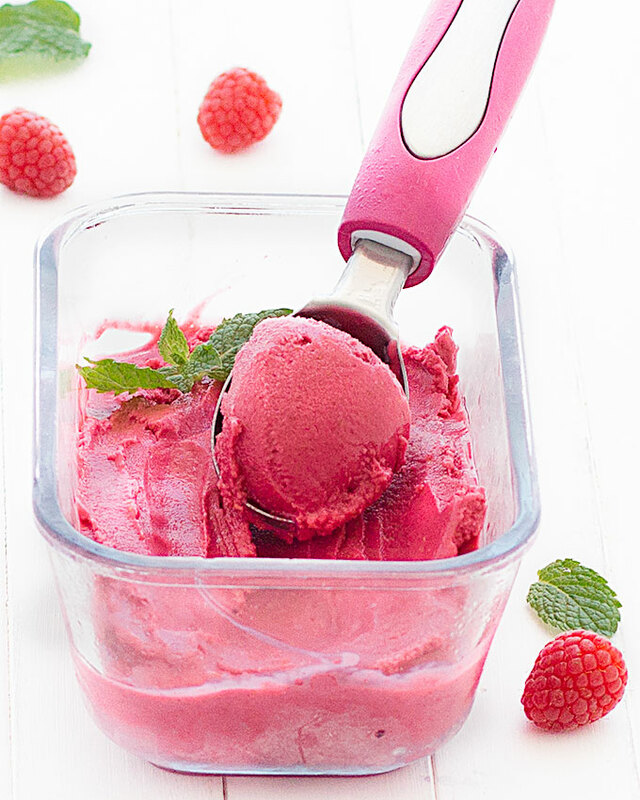 Only 3 ingredients needed to create this amazing healthy raspberry frozen yogurt. 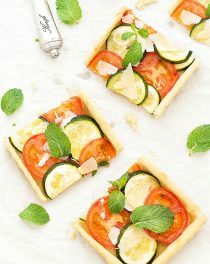 It’s the perfect no-guilt dessert for summer! Combine all the ingredients in a blender and blend until smooth and creamy. This should take about 4-5 minutes. At this point the frozen yogurt can be served and will have the texture of soft serve. For a firmer texture, transfer the mixture to a container and freeze for an hour or two before serving, stirring every 20 minutes. Once fully frozen, you may have to let it thaw for few minutes before you can scoop and serve. If using an ice cream maker: combine all the ingredients in a blender and blend until smooth and creamy. This should take about 4-5 minutes. Transfer to the refrigerator and chill for an hour. Once chilled, pour the mixture in your ice cream maker, and freeze according to the manufacturer’s instructions. Remove the raspberry frozen yogurt and store in the freezer until ready to serve.